Happy Thursday everyone! What are your plans for the day? 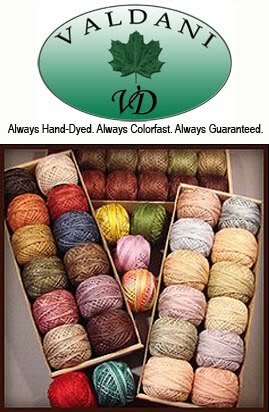 I - will be sewing with my friends at Cinnamon's today. I love Thursdays... doesn't it feel good to always look forward to a specific day in the week? Sundays - for Church... Friday's - last day of the work week (for most people)... Me.. I LOVE Thursdays! Today I'm just going to work on hand projects... you see... this Sunday is a new sewing group I'm joining... it's the UFO Club at Cinnamon's. We meet every other month (so far apart...sniffle) and the whole objective is to finish UFO projects. Our facilitator (Faye) wants us to give her 5 projects that we want to get finished. We get a star on our chart (it's simply the small things that motivate us...) when we have one FINISHED!! Then after the 5 are all done.. we get something else.. I'm not sure what that is.. I don't really care.. I just want to have something to motivate me to FINISH UP STUFF! I've got my 5 things all ready on my list... they are special projects for Cinnamon's that I want to finish for Karen (owner). Then I'll work on 5 things for ME! Remember Donkey Kong? It was my all time favorite... my friend Lynn B. and I would play it by the hours. We BEAT it several times. I was VERY GOOD at jumping and she was better at the swimming part...we were a good team... aaaaaaaaahhhhhhhhhh memories... LOVE THEM! Here are two pictures... I asked myself... WHY? when I saw them!! This one of for those of you that love the Vulcan look!!! Star Trek - beam me up Scottie! Tee hee!! This had the caption - "the new look - that will be popular soon". I DON'T THINK SO.... YACK!!! HEY.... have you ever wanted to do this? Ketchup and mustard anyone? Can you see the look on the face of the waiter/waitress when they saw this on the counter? 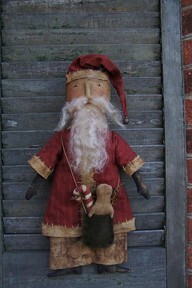 I found another one of my loves... Santa's... primitive ones... isn't this fellow cute? Love this little fellow... he's got a great little bag full of a "snowman", candy cane and I think... a twig! He sure would look great with my Santa collection. HE BELONGS IN MY HOUSE!! Now this fellow has had WAY TOO MANY bananas! 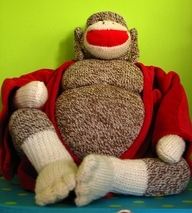 Sock monkeys are special to me. When my son, Toby, was just one year old (he had his birthday in the hospital) we traveled home (from Norfolk to Indiana) for 2 week vacation. He got VERY sick - dehydrated - while gone and we had to put him in the hospital and spoon feed him liquid for about 48 hours. He was so sick. My cousins came to visit and brought him a brand new sock monkey as a gift for his birthday. When he saw that sweet monkey... he sat up in bed and got a big smile on his face and began getting better very QUICKLY... so... as you can see... I love them! It's a simple hand towel.. they've folded it up and sewed some pockets into it... added a tie and it's all set for traveling. This would be good for the guys and their shaving stuff too. Then when you get home... just empty the contents and throw in the washer! 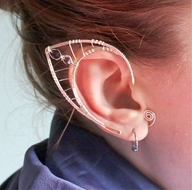 Cool don't you think? 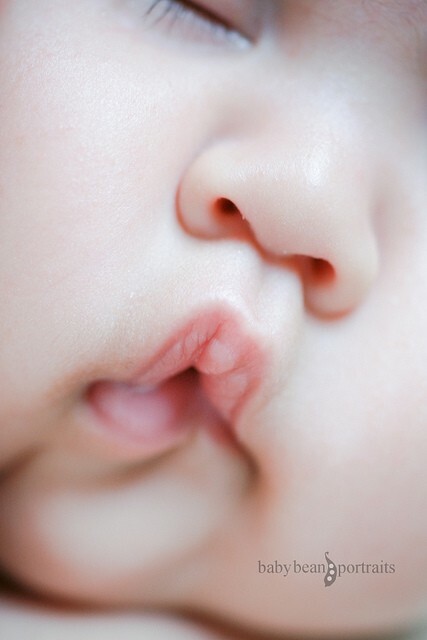 So sweet... that little button nose and those squishy little lips... I can just smell the baby lotion ... can't you? What a wonderful thing in this world... babies!!! Well... I finished my quilt yesterday... I have to get it pressed, de-threaded - and then make my backing. This thing is HUGE!! I threw it on our Queen bed and it touches the floor on both sides!! Yippee.... I wanted it big and I got my wish! It's off to the quilters! Have a happy day sewing or crafting or reading, or resting... just have a HAPPY! !